Last summer I posited that a crop top could be worn to work professionally — i.e., to a workplace like a P.L.L.C. 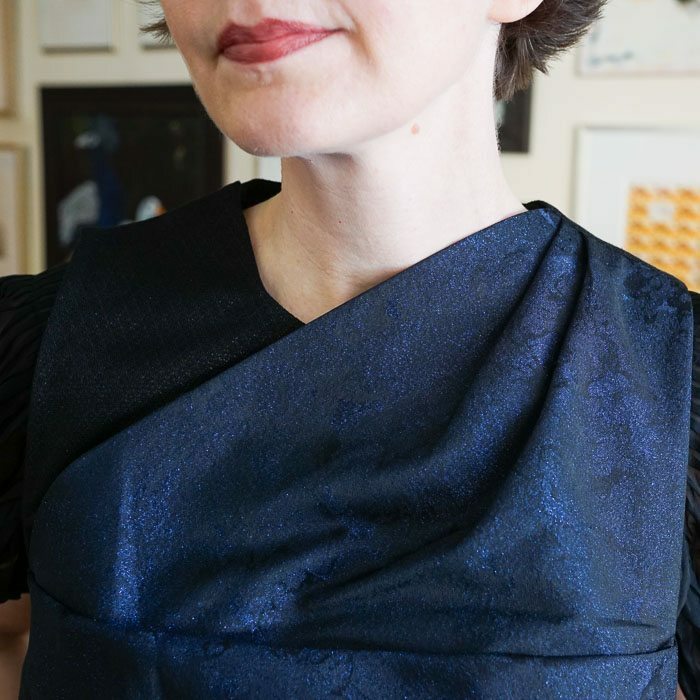 or similar association by a woman who is dressing to meet with colleagues or clients — when paired with a skirt and blouse or jersey. 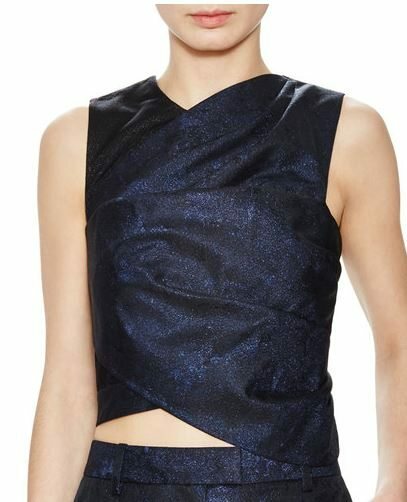 I bought this 3.1 Phillip Lim crop top, but it took me several months to find the right skirt to pair it with. I was looking for a skirt that was high-waisted and somewhat fitted. Bear in mind, I did not devote those months exclusively to the search. I’ve been quite busy. But during that time I was running a desultory search, and I ordered (and returned) a half dozen black skirts from YOOX, JCrew and FarFetch before finding one that works. Ironically (or not), the winning skirt is also 3.1 Phillip Lim. I’ll linger over the skirt for a minute because it deserves a little discussion. 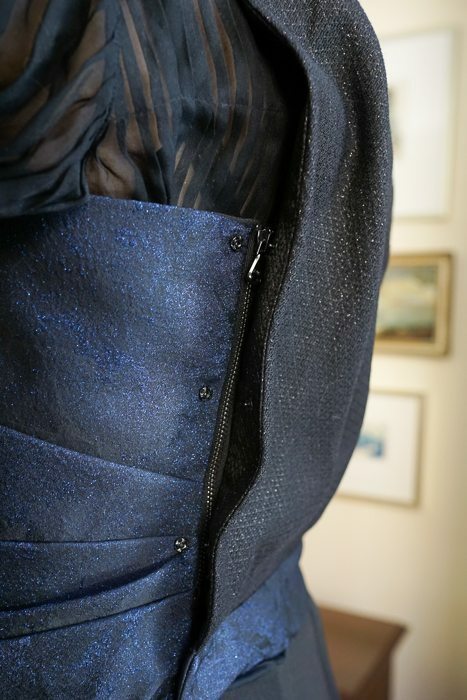 The back is created from three irregularly shaped pieces of fabric and the seams create a very pretty fit. Rather than ballooning, the way A-line skirts sometimes do, this skirt provides plenty of room through the hips and rear, but then narrows to fit more closely (not tightly) through the legs. It’s sort of like a mermaid or fishtail silhouette, but much more subtle. Note: The skirt is more snug on me than on this emaciated model; this is a rare instance in which I think I look better than the model. 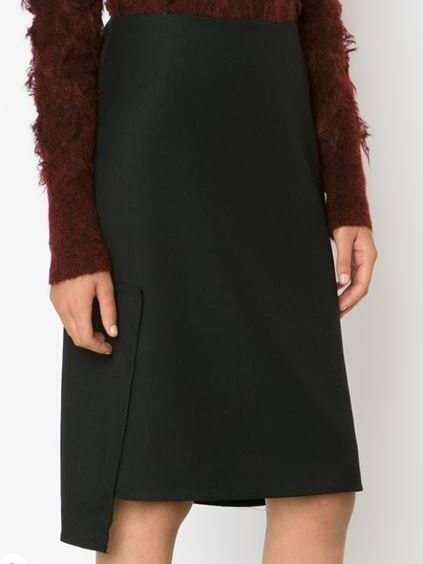 This skirt is still available through FarFetch (shipping to U.S. is free) and Saks. I am rating this skirt, at this price, a strong BUY. Back to me. 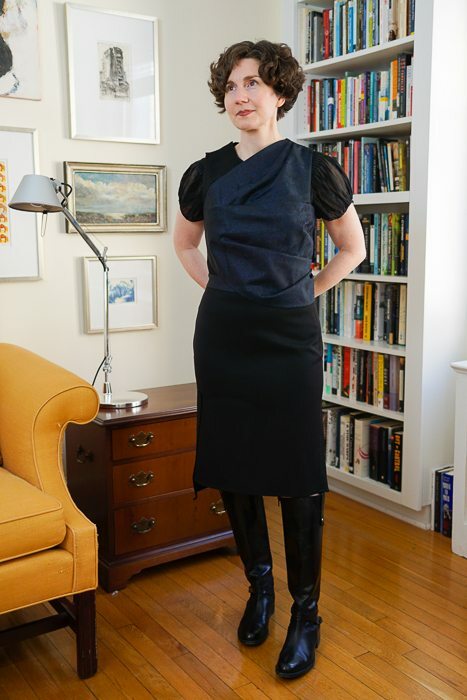 Here’s the outfit I put together: crop top over silk fortuny-pleated blouse with the fitted black wool gabardine skirt and boots. Ready to go to the P.L.L.C. I’ve turned a little so that you can see the asymmetrical hem. The top is beautifully pleated. If I weren’t wearing a blouse underneath it, however, it would be very bare. The armholes are quite deep and squared off and the overall length just reaches the smallest part of my torso. This little top is highly engineered. Just to show you how clever (and diabolical) it is, here are a few close-up shots. The first time I tried it on, I wrenched my back trying to reach the zipper, snaps, and hooks. The neckline fits closely. 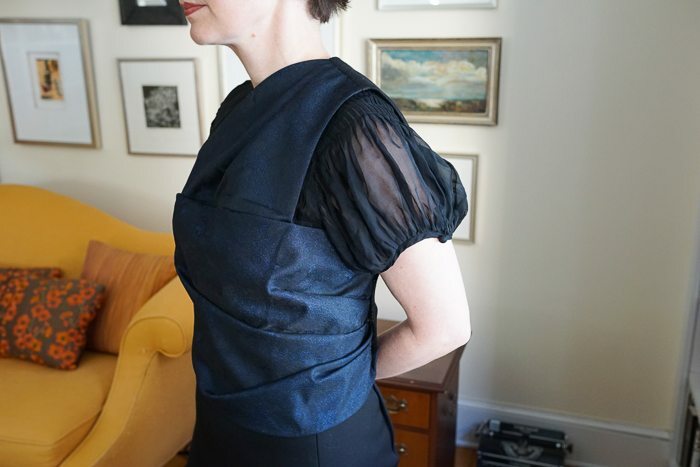 A row of hook-an-eye closures actually closes the neckline along the right shoulder. These are very hard to catch and keep closed, so I am going to replace them with little snaps. 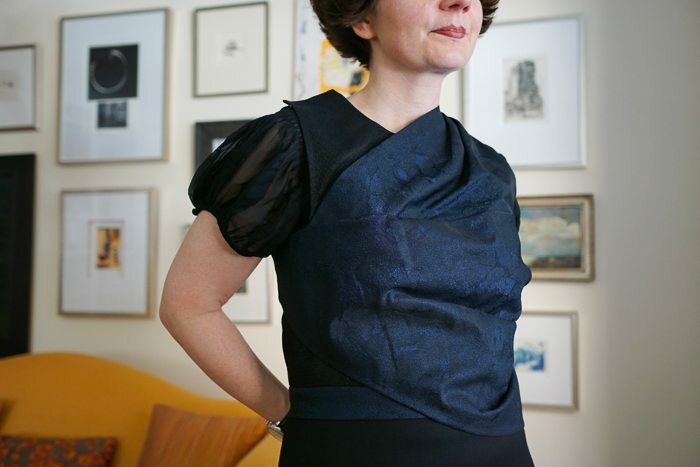 Fabulous — I just love all the interesting pleats and folds of the top and the skirt, and you wear it with aplomb. 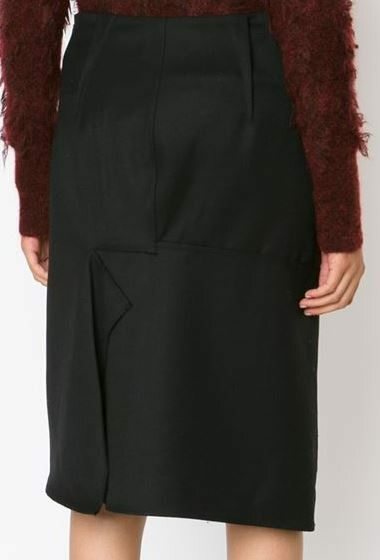 Question re the skirt: I am quite interested in perhaps purchasing, but trying to predict fit. I am 5’3″ and pretty much buy only petite. I don’t recall if you have mentioned your height, but how did the length work for you — did you have to get it hemmed? I would think a skirt with this design might be trickier than your average hemming. Hi Bubu — I am also 5’3″ and the length was perfect as it came to me. 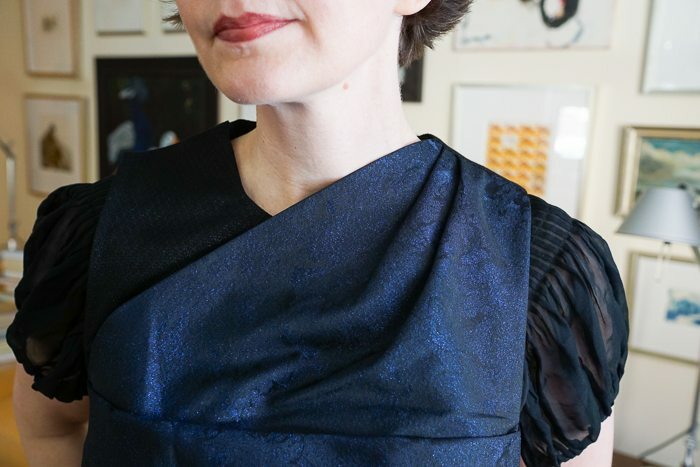 One of the nice things about asymmetrical hems is that they can be flattering even if some parts of the hem are above/below your best length. This particular hem would be difficult to alter, so if you buy the skirt and it’s not a flattering length on you, I’d return it. Mine is a size 4. Good luck! Beautiful top! And an overall gorgeous outfit. I love it! This is not a “throw on and go” kind of outfit. This is special – almost formal wear to me and I like that cross over to work wear. 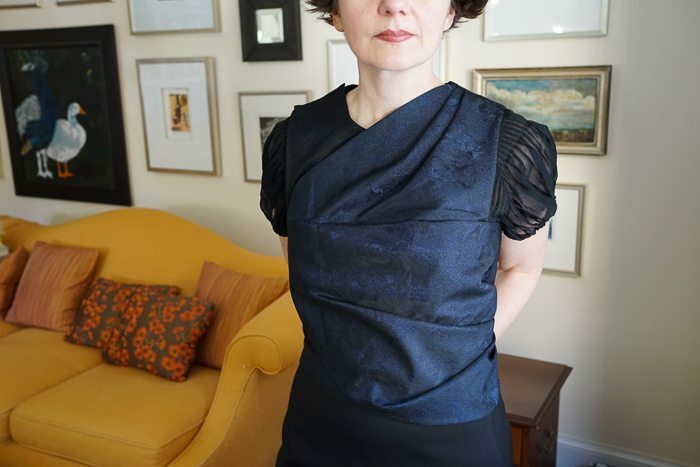 Maybe it’s also the blouse – there is something historical about the look. And I love it. This outfit is one of my favorites! If it were me, I would have glanced at that top — sparkly? midriff baring? — and scrolled right past. And never would have thought of putting two deconstructed pieces together without becoming a Braque painting. Thanks for expanding the horizons of my imagination. Thank you! Your comment makes me think of the movie, Inside Out. The protagonists are on a Homeric journey and one of the hazards they encounter along the way is the part of the brain that manages Abstract Thought. Deconstruction is involved. Regarding scrolling past — that’s a legitimate (and efficient) response. But occasionally, when you see something that really strikes you (because of the color or print or fabric or shape), I think it’s ok to dawdle. Phenomenal ensemble. One of the best constructions you have done to date. I agree with all the others: I would have gone right past the crop top as too young and inappropriate for me. Now you have me on the hunt! Thank you! This outfit looks like it was all made to go together (and looks fab! ), so I’m interested to see how else you manage to style it in the future.